Cherrytree Records will be in New York City on October 12th for the biggest day of their lives... the day their first official album FREE WIRED will be released. Cherrytree Records is teaming up with the Hard Rock Cafe to throw an album release party for us in Times Square NYC at the Hard Rock Cafe where they'll be performing songs from our new album with a bunch of special Cherrytree guests and the show will be shown on the huge screen in Times Square. This show will be FREE, all ages, and open to the public and their new FREE WIRED album will be there for sale so you can get your copy at the show. They'll also be around to sign em and take flics with yall before they head to our sold out show later that night with Mike Posner at Irving Plaza. A FREE All Ages Event. 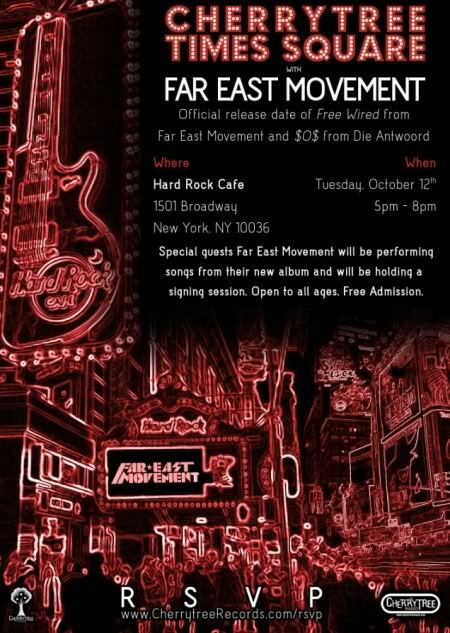 Performance by Far East Movement and signing session after. Copies of their new album FREE WIRED will be on sale at the event. Simulcast live on Cherrytreeradio.com and benefiting Pinktober.